A new year is upon us, and many homeowners in Oakville and throughout the surrounding areas have an eye toward home renovation. If you’ve found yourself reading design articles and poring over photos, then you may have noticed some increasingly prevalent interior design trends. With that in mind, here are five trends that we believe are going to have a big influence on home renovation in 2019. Among the most exciting interior design trends for custom kitchens is expanding tile from the countertop all the way to the ceiling. This creates what is known as a feature wall and an impressive one at that, and it can accommodate range hoods, floating shelves and the like. You also have a lot of options when it comes to colours and geometric shapes, which gives you great versatility in designing your kitchen. Innovations in cabinet design have led to the modern kitchen having less of them. That has opened up a great deal of wall space. So, what do you do with it all? Many interior design experts recommend adding windows. Natural lighting for cooking spaces is in, and it not only makes your kitchen feel a lot bigger but gives it a certain aesthetic that isn’t easily achievable otherwise. Many homeowners coordinating an interior home renovation are opting for wood on wood on wood… You get the picture! 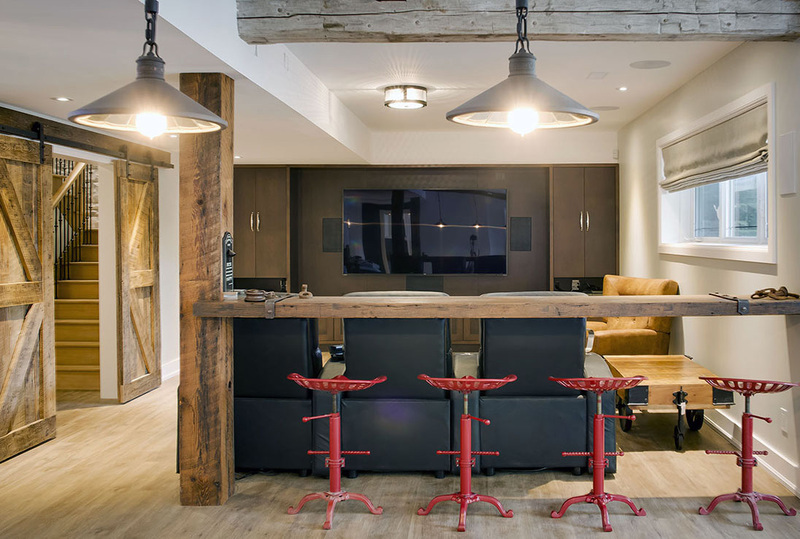 Wood not only adds warmth, but it makes a room ooze personality. It also matches well with whites, greys and all the other neutral colours that people tend to choose for the walls, cabinets and other aspects of their kitchens. Many companies offer more than 150 distinct variations on white. While stark whites have long been the obvious choice for kitchen cabinets, that is beginning to change. Off-whites are warmer, and they let you use the cabinets as a tie-in rather than just as a neutral base to design around. Industry research shows that engineered quartz became the most popular material for countertops in 2018, and that is expected to continue in 2019 as well. This natural material is an excellent investment that is not only incredibly durable but can take on the look of more expensive materials. It also helps that quartz prices are down thanks to an influx from foreign markets, and even trade tariffs are unlikely to increase quartz prices enough to slow this trend. This is only a sampling of the interior design trends that will likely to continue to be popular in 2019. So, what’s the take away? It helps to have a professional on your side as you’re making these important decisions. At Alair Homes Oakville, we’re here for you through every stage of the design and construction process, and we’ll walk you through your options so you can make design choices that fit your lifestyle and your budget. If you’re ready to get started, give us a call and let’s schedule a complimentary, no obligation consultation.